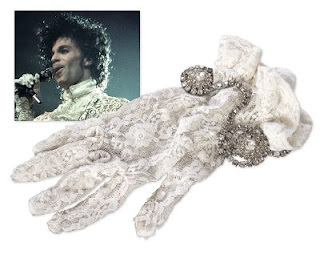 Prince's impact on fashion was recognized globally. He wore the white lace glove adorned with rhinestones during his concert at Rupp Arena in Lexington, Kentucky on December 15, 1984. After Prince's performance, he attempted to toss the glove into the audience, but it fell into the lighting scaffolding below. Terry Wayne Lewis, a Rupp Arena contractor, retrieved the glove after the show. Purple Rain was Prince's sixth studio album and it was the first time he featured his band The Revolution. The album was released on June 25, 1984. The songs When Doves Cry and Lets Go Crazy topped the United States singles charts. It has sold over 25 million copies worldwide, making it the third highest selling album ever. A notarized letter from Terry Wayne Lewis accompanies the glove. Lewis also provided a copy of his 1099 form from 1985 showing his employment with the IATSE Local 346, a theatrical stage professionals union in Lexington. Bidding for the glove began at $5,000. Elsewhere in the auction, a pair of custom made drumsticks used by John Bonham in the mid-70's failed to sell with a $16,000 minimum bid as did a copy of Blonde on Blonde signed by Bob Dylan which had a minimum of $5,000 and animation cells from the opening sequence of The Partridge Family whose consignor was looking for at least $40,000. A signed publicity photo of Charlie Parker did get a winning bid of $10,000.